On yet another dark and, meteorologically speaking, miserable Tuesday evening, the brightness and sunshine that is Bushwalla took to the stage of The Roebuck Pub in London Bridge with one intention: to entertain. Bushwalla is an interesting fella. He’s the kind of guy who is just as comfortable performing to a handful of people as he is to a venue of thousands. He’s the kind of guy who will stop in the middle of a song, jump on the table in front of you and start juggling with a huge smile on his face. I had been informed that he had spent some time performing as a clown - so this wasn’t completely unexpected. While Bushwalla’s circus antics are highly entertaining it should also be noted that this guy has a great voice and the combination makes for a fantastic show. 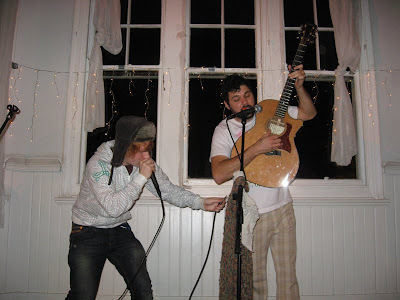 Most of his singing has an acoustic, hip hop sound; there were no drum machines or accompanying musicians (apart from Ed Sheeran who was chosen from the audience for a little free styling rap later on in the evening), just Bushwalla, an acoustic guitar and a microphone. Bushwalla (real name Billy Galewood) originally hails from Cleveland, Ohio, but now lives in San Diego. 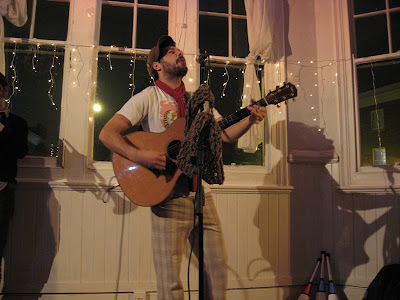 Former roommate and still bezzy mate of Jason Mraz, he has toured extensively throughout the U.S., independently releasing his latest album Ghetto Blaster, which features the likes of Spooner Oldham, Speechwriters LLC, Tristan Prettyman, and Jason Mraz’s rhythm section. 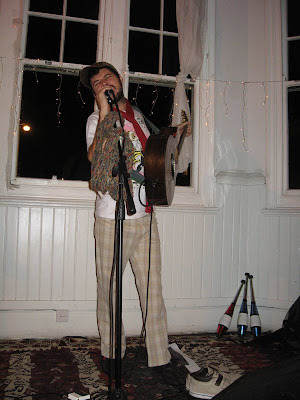 Bushwalla brought sunshine and cheer to many a living room up and down the States back in 2006 when he did an LRC tour – this is becoming an increasingly popular way to get your music out there and cut out the headache of overpriced tour venues, plus well it’s a lot of fun! Incidentally, TLS has already a hosted an LRC for The Makepeace Brothers (friends of Bushwalla) earlier this Summer. 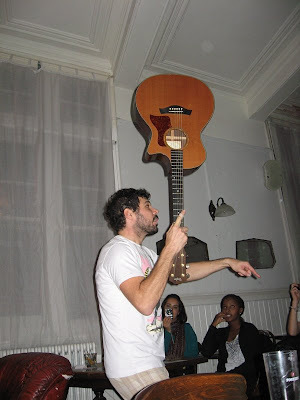 Bushwalla about to balance his guitar on his chin! I had the pleasure of sharing a couch for the evening with fellow Bushwalla loving music bloggers and friends of mine Abi and Katy from Connect. If you are ever interested in hosting a Living Room Concert, you should check out their website and drop them a mail. Bushwalla played for well over an hour and I was so captivated by his performance I totally forgot about the time and found myself grabbing my bag at speed and running for the door in the hope I would catch the last train home. I just made it and then stayed up to watch the US election. i was there! didn't see you - silly me! Was a really good evening, I've been a bit busy so haven't been able to write about all the acts who played. Your beardedness, please forgive me for not having said hi, I had to shoot through to catch the last train home, next time!